I used this photo for a cover on a history of .Max M..Shake (my father). He worked many of his 43 years with the .Ray Mines at this location: the No.4 Shaft and Candlehouse. This was the main man-shaft to the underground mine where .Max started in 1926 as a car-checker and sample grabber. He soon became a timberman and after becoming fluent in Spanglish, he worked underground in several capacities until becoming a level boss; mine rescue leader, first aid instructor and later mine safety foreman. .Max called himself the "Old Man of the Mountain" ...signed family letters with that nickname. Underground the Mexican laborers called Max "Escopeta! "...Spanish for shotgun. Out of the photo to the left was a huge "change-room" where the miners changed their street clothes for working clothing and where they showered and changed again at the end of the shift. The building to the right housed mine offices. Nearly all the underground miners walked trails from homes to this #4 shaft, including the several hundred Mexican laborers who walked through the caving grounds from their homes in Sonora a couple miles away. This #4 shaft and hoist sat on a ridge-top overlooking American Townsite and had a view of .Boyd Heights, .Zachary Hill, Mineral Creek and downtown .Ray. 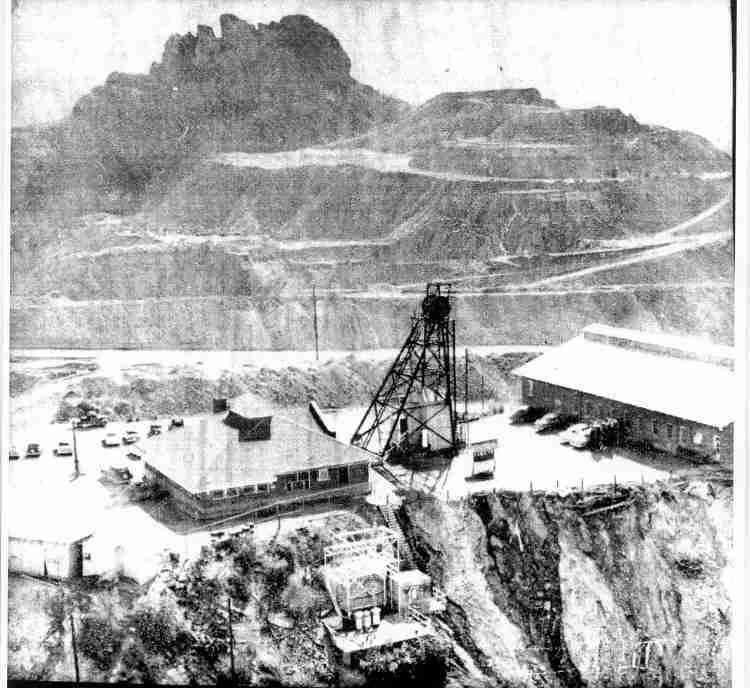 The photo was made in the mid 50's after it was decided to convert from an underground mine to an open pit mine. Behind the hoist frame, on the hill, can be seen the haul roads and ore benches for excavating removing the overburden to expose the copper ore body. Photo credit: The .Ken .Shake Collection. Ken started a .Ray history project several years back and had a collected more than 5,000 colored slides and B&W photos of and around .Ray. Unfortunately all was lost in a motorhome fire in 1991. Also lost was 500 pages of text on the life and times of his parents in .Ray. He retired after 40 years as an Air Traffic Controller with the FAA (mostly on the West Coast). He has been writing and carrying a camera since .Ray High School days. While visiting his parents in .Ray on a number of occasions, he got acquainted with Mrs. Lopez; provided her with a little editorial assistance and a few photos to help her get her project started. My name is .Ken .Shake, son of .Max & .Leta .Shake, long time residents of .Ray, Arizona. Dad and Mom went to work the .Ray mines in 1926; Dad retired there after 42 years and passed away there (sic) in 1985. I lived in .Ray from 1926 until I graduated from .Ray High School in 1941 and went into the USAAF. My Brother .George and Sister .Elaine were born at the .Ray Con Hospital in .Ray, as was my first son .David. I have photographs of that hospital, as well as information on Dr. O. E. Utzinger who was the mine's chief surgeon. He was also a member of the School Board. Assembled by ovk. Last reviewed 04/02/2006.